My knitting mojo has, sadly, been somewhat slowed of late, but I did recently finish off my second ever successful crochet project (does this mean I'm bicraftual now?). 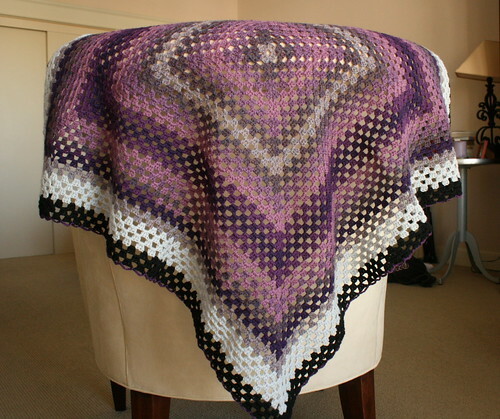 This was one of those projects that I started and worked on in bits and small pieces in between larger projects and one day I was surprised to find that all the yarn had run out. Yarn: Knit Picks Palette, 1/2 ball each of Lantana, Eggplant, Iris Heather, Clematis Heather, Mist, Mulberry, Huckleberry Heather, and Black (don't ask me which one is which...except for the black -- that one's pretty obvious), all left over from my Dipped Infinity Scarf, which...huh...I guess I never blogged about. In an effort to use every last bit of my yarn, I did have to finish off a few rounds with different colors. All of these purples are so similar that I don't think it's noticeable and, actually, I kind of like that it's imperfect in that way. I did the same edging as I did with my last Giant Granny Square and am happy with it. This is a smallish-sized baby blanket and will be a gift for one of the many gals I know right now who will soon be having little ones. I'm working on one right now as well and am making slow progress. Your's looks amazing. It's lovely! Those are my favorite colors together ~ some little baby is going to be very lucky to snuggle under that. 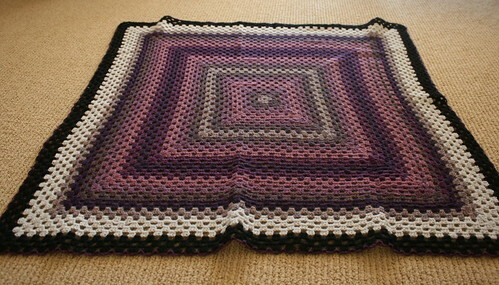 Having those different shades of purple enhances the look and I think is what makes the blanket unique and special. Oh, how beautiful! I love seeing so many shades of one colour together like that. And yes, I'd say you're bicraftual! Or maybe ambicrafturous? Oh, and we visited San Francisco in 2007, but we always talk about going back. Maybe we'll meet in person next time we're there! That's really really lovely! It looks great. Beautiful granny square. I'm working on one too. Been working on it for a while now but only doing the odd round now and then. Mine is in Manos Silk Blend. All those shades of purple look amazing together! Beautiful work, that is one lucky little baby. Gorgeous!! the plums and greys are simply perfect. omg hilary that turned out so beautiful! I love this post. Just, love it.